On June 18, 2010, the Illinois Mennonite Historical & Genealogical Society presented Immigrant Day 2010, featuring the descendants of Joseph and Maria Neuhauser Schrag (Schrack) through their five immigrant children: Johannes, Peter, Andrew, Magdalena and Barbara.This event was the fourth in the Illinois Immigrant Series. Over 150 people attended the Saturday program, at which time presentations on each descendant were given. 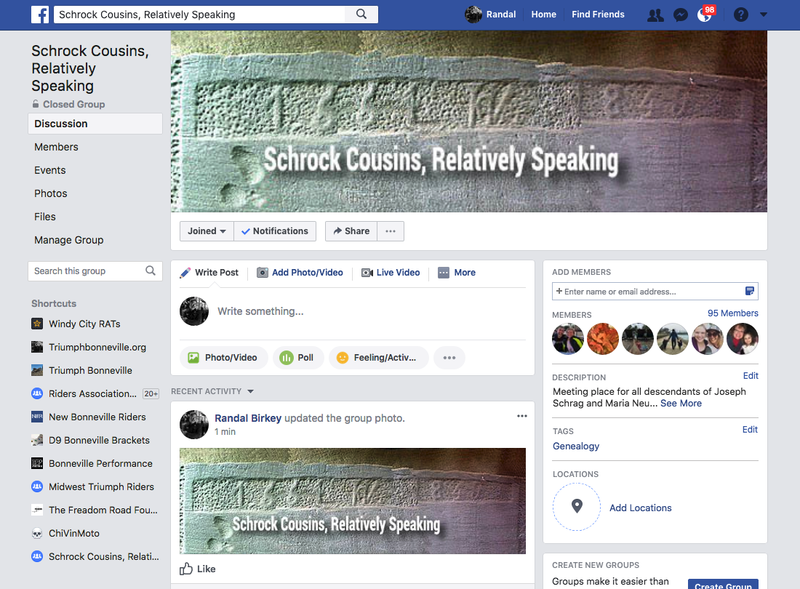 At the time of the Schrock Immigrant Day event, scant information on Magdalena Schrock, daughter of immigrant Johannes, was available. Thanks to the diligent research of Ardys Serpette, a more complete history is now presented for the record. Mt. Zion Cemetery is a quiet place. From its situation on a high spot surrounded by corn and bean fields, the towns of both Deer Creek and Eureka are visible. When I visited with my camera in early October, the only noise was the strong northern breeze. The simple inscriptions on the old gravestones gave testimony to lives of struggle and hardship, joy and grace, lives that spanned the 19th and 20th centuries and saw fundamental changes to the central Illinois landscape. The graves of Joseph and Magdalena are located in the western edge of the cemetery in a shady spot. Next to their stone is a much smaller one marking the spot where their teenaged [sic] son Christian was buried in 1877. An infant daughter is supposed to be buried in the Mt. Zion Cemetery, but I could find no trace of her grave. One can assume, though, that she lies near her parents. In that secluded spot it is easy to imagine Joseph and Magdalena’s lives, and the lives of their children, as quiet—even, perhaps, to our fast-paced mindsets, as somewhat staid and unchanging. In reality, the story of this family unrolls dramatically and is full of unexpected twists. For starters, neither Joseph nor Magdalena began life in Tazewell County. Both were offspring of pioneer families who left their homes in Europe for the New World. And while some of their children and grandchildren stayed rooted in the central Illinois area, others moved west—as well as east—and made their homes in lands far from the corn and soybean fields of Tazewell County. Joseph and Magdalena were witness to historical events such as the Civil War, and for Joseph, World War I. Their children and grandchildren, some of whom left their foundational Anabaptist faith for Protestant churches, saw more wars, extensive and rapid technological advances, and changes in social mores. Their lives unfolded in the larger context of American history, and the events and culture that surrounded them shaped their stories. This is a family that took root in America and flourished—and some of whose branches continue to bloom today. –Ed. Life was much more uncertain in those times. Magdalena’s mother died in 1858 at the age of 53, and her father married Jacobina Phebe King in 1861. Magdalena was only thirteen when her mother died. One can speculate on her sadness at losing a mother at such a formative age and of not having her mother with her for happy events, such as her marriage to Joseph in 1866, or for the birth of her children. Her father died in 1875 at the age of 73. Magdalena married Joseph Yoder on 18 December 1866 in Meadows, Illinois. Joseph was born 18 December 1841 in Munich, Bavaria, Germany. He came to the United States at the age of 14 and settled in the Deer Creek area of Tazewell County, Illinois. It must have been an exciting journey for a young teenager. It is a great distance from Munich, Germany to Tazewell County, Illinois, and this journey changed the course of Joseph’s life. After his marriage to Magdalena the couple settled in Goodfield in Montgomery Township, Woodford County, Illinois and went on to have six children. Magdalena died in 1914 at the age of 68. According to the The Eureka Times, a weekly paper, she died between February 26 and March 5, 1914 and was listed as a member of the Amish Mennonite church. She and her husband are buried in the Mt. Zion Cemetery north of Deer Creek, Illinois. 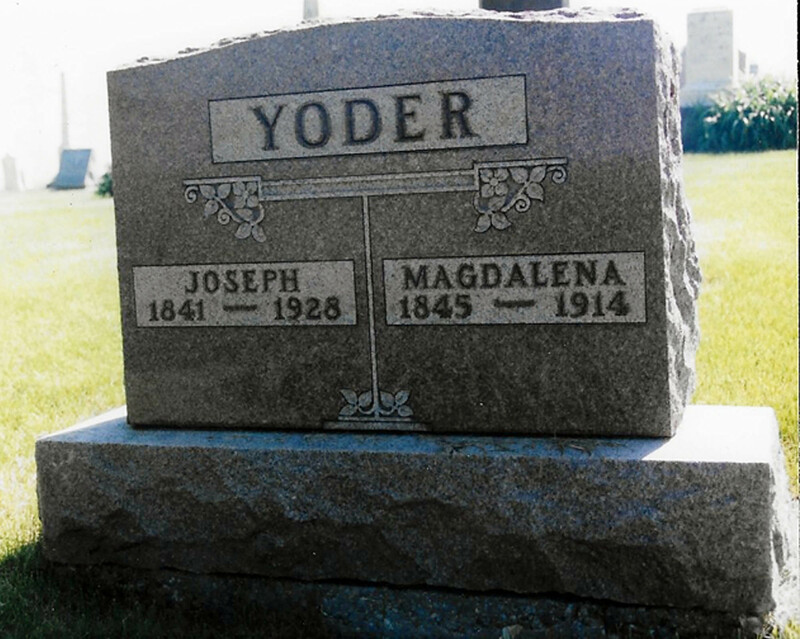 Joseph Yoder died at his home in Goodfield, Illinois on June 18, 1928 at the age of 86 years, 6 months. Firman “Joe” and Esther Yoder, Joseph and Magdalena’s grandchildren, were attending Shurtleff College in Alton, Illinois when their grandfather died, and they were able to come home for the funeral. Those who attended from a distance included Mr. and Mrs. Joseph Yoder, son and daughter-in-law of Hamlet, Indiana, Firman Yoder of Alton, John Birkey, John Schrock and Misses Lena and Ella Schrock of Fisher, Ben Kauffman of Melvin; George Merrill of Lincoln, John Schrock and son of Pekin, Illinois, and Mrs. Katie Stecker, also of Pekin. Joseph Yoder and Magdalena Schrock were the parents of six children: Mary (1868-1952), an infant daughter (1870-1870), Christian (1877-1893), John M. (1871-1944), Joseph (1874-1939), and William (1885-1942). Y.1 Mary Yoder, born in 1868, was married on 13 February 1895 in Eureka, Illinois to Charles Andrew Pepper. They had no children. In 1939, the Peppers moved to Morton after farming near Deer Creek for 54 years. Mary died in 1952 at the age of 84. Her husband Charles, who was born 17 January 1872, died of a heart attack on 8 May 1946 at his home. They are both buried in the Mt. Zion Cemetery, Deer Creek, Illinois. They were members of the Deer Creek Methodist Church. Y.2 An infant daughter died around 1870 at the age of three years and three months. She is buried in the Mt. Zion Cemetery, Deer Creek, Illinois. There is no evidence of her stone today. Y.3 Christian Yoder, born in 1877, died at the age of 16 in 1893. He is buried in the Mt. Zion Cemetery, Deer Creek, Illinois next to his parents. Y.4 John M. Yoder was born 22 December 1871 at Gridley, Illinois. He married Matilda Finley of Eureka, Illinois on 30 November 1905. John was a state highway maintenance man appointed under Governor Henry Horner, a Democrat whose administration (1933-1939) was marked by its integrity, good fiscal management, and advocacy on behalf of the indigent. John worked on the roads between Goodfield and Bloomington. He was a member of the Woodford County Democratic Central Committee. John died 14 February 1944 at the home of his daughter, Mrs. Robert [Esther] Reel in Morton, where he was cared for during his final illness. Matilda (Tillie) Finley, his wife, was born 29 August 1873. She was a member of the Methodist Church in Eureka. After being ill for four months, she died on 12 August 1950 at the home of her daughter, Mrs. Esther [Robert] Reel, in Morton. John and Matilda are both buried in the Olio Cemetery in Eureka. John M. and Matilda were the parents of two children: Firman Edward (1906-1982) and Esther (1910-1962). Y.4.1 Firman (Joe) Edward Yoder was born 14 September 1906 in Goodfield, Illinois. In 1929, Firman graduated with a philosophy degree from Shurtleff College at Alton, Illinois. Shurtleff College, originally founded as Alton Seminary by the Reverend John Mason Peck, was the oldest Baptist college west of the Appalachians prior to its absorption by the Southern Illinois University system in 1957. Joe also graduated from the University of Illinois with a Master of Science Degree in dairy management. He married Esther Bradley at Madison, Wisconsin on 28 November 1930. She was born 28 October 1904 at Omro, Wisconsin. Esther attended the University of Illinois, where she studied music. In 1943, the family moved to Portland, Oregon, where Joe became a manager of Silk Hat Restaurant. The move from central Illinois to Oregon exposed Joe and Esther to some very interesting people and events. In 1949, Joe went to work as a cheese maker for Eugene Farmers Creamery. He also served there in positions such as as plant supervisor, sales manager and refrigeration engineer. He retired in 1969 after twenty years at the creamery. The manager of Eugene Farmers Creamery was Fred Kesey, who died the year Joe retired. Kesey’s wife, Geneva Smith Kesey, remembers Joe as a “rock hound,” and she still has a lot of the rocks he gave her.4 Fred and Geneva Kesey’s children, Ken and Chuck, grew up as “creamery rats”5 in the 1940s and 50s, which would have coincided with some of Joe’s years at the dairy. Chuck Kesey remembers Joe as being a very educated creamery man for the time.6 Ken became a writer (One Flew Over the Cuckoo’s Nest is his best-known work) and a countercultural icon during the 1960s and beyond. Chuck Kesey went on to found his own dairy, Springfield Creamery, which manufactures natural and organic products such as Nancy’s Yogurt. Legendary rock band Grateful Dead held a 1972 benefit concert on behalf of Springfield Creamery which drew more than 20,000 people. What an interesting place and time! Perhaps the Yoders thought so, too — they remained in Eugene for the rest of their lives. Joe died there on 9 March 1982, and Esther on 16 June 1993. They are both buried in Lane Memorial Gardens, Eugene, Oregon. They were the parents of two children: Norma McLeod Swanson (1941-2005) and Edward J. Yoder. Y.4.1.1 Norma Yoder was born 22 April 1941 in Alton, Illinois. She married Ronald McLeod in 1965 in Springfield, Illinois. They had two daughters: Tina Christine Lake of Eugene, Oregon and Jana Lynn Weeks of Rogersville, Missouri. After her divorce in 1984, Norma married Arthur Swanson in August 2001 in Eugene. She completed nursing school in 1974 and worked as a registered nurse in the Sacred Heart Hospital rehabilitation unit for more than 25 years. Norma died of pulmonary fibrosis on 30 October 2005 in Eugene, Oregon. Her service was held at the First Baptist Church in Eugene. Y.4.1.2. Edward J. Yoder lived in Eugene, Oregon. Y.4.2 Esther Yoder was born 5 June 1910 at Deer Creek, Illinois. She married Robert S. Reel on 19 August 1934. Esther was active in the Community Church and a member of Chapter 974 of the Order of the Eastern Star, in which she served as worthy matron (presiding officer). This fraternal organization is open to both genders; however, women must have specific relationships with Masons. Esther was also a member of the Morton Chapter EE of P.E.O. The P.E.O. Sisterhood is a woman’s society with a focus on social and educational opportunities for female students. It was founded in 1969 in Iowa, and its acronym was long an official secret, although there was speculation it stood for “Protect Each Other.” In 2008 its website responded to the mystery by indicating P.E.O. stands for “Philanthropic Educational Organization.” Mennonite churches have traditionally discouraged or banned participation in secret societies, although this position is not a uniform one. Presumably this was not the case in the Community Church of which Esther was a member. She died of cancer on 30 July 1962 at Las Cruces, New Mexico. Esther’s husband Robert was born 26 October 1905 at Deer Creek, Illinois. He owned a barbershop in Morton for 16 years. He seems to have been continuing in the family business. IMHGS member Guilford Zook, now over 90 years old, remembers being taken for haircuts as a boy to a shop run by the Reel family in Deer Creek.7 In 1951 Robert and Esther moved to Las Cruces, New Mexico, where Robert purchased another shop which he still owned when he died 1 August 1970 at Peoria, Illinois of leukemia. Robert and Esther are both buried in the Masonic Cemetery in Las Cruces, New Mexico. They were the parents of two children: Carolyn Beebe Powers (1939-2004) and Richard D. Reel. Y.5 Joseph M. Yoder was born 13 March 1874 in Pekin, Illinois. On 20 May, 1902, he married Wilhelmina Antoinette Punke in Woodford County, Illinois. According to records, as of 12 January 1920, the family was living in Pulaska Township, Williams County, Ohio. Later they moved to Hamlet, Indiana. Antoinette was born 1874 in Panola, Woodford County, Illinois and died 16 April 1930 in Chicago, Illinois. Joseph died on 24 September 1939 in Canton Township, Starke County, Indiana. Joseph and his wife are both buried in the Crown Hill Cemetery, Knox Township, Starke County, Indiana. They were the parents of three children: Tellium Antoinette (1903-1931), George Joseph Yoder (1907-1947) and Warren Robert Yoder (1911-1928). Y.5.1 Tellium was born 21 July 1903 in Eureka, Illinois. She taught music at Hamlet, Indiana. At the time of her death on 28 August 1931 in Oregon Township, Starke County, Indiana, she was engaged to marry Walter Siendentop of Hamlet, Indiana. The cause of her death, so heartbreaking at such a time of promise, is not known. Y.5.2 George Joseph Yoder was born March 1907 in Panola, Illinois. George died on 7 August 1947 of leukemia. He was married twice: the first marriage was in 1933 to Marguerite Ewing. They had no children and eventually divorced. He married the second time to Rose May Heiner on 10 July 1937. They had three children, each of whom was known by a humorous nickname: William George “Cocky” Yoder (1941- ), Richard C. “Bobo” Yoder (1942-1964) and Roselee Annette “Toot” Yoder (1947-). Y.5.2.1 William George “Cocky” Yoder was born 9 January 1941. He married Karen Hamilton. They had no children. One of the passengers killed in the crash of Flight 304 was celebrated American opera singer and actor Kenneth Lee Spencer, whose movies included Cabin in the Sky and whose portrayal of Joe in the 1946 Broadway revival of Show Boat had been much acclaimed. Also on board was Mrs. Marie-Hélène (Pierre) Lefaucheux. Ms. Lefaucheux was a member of the French delegation to the United Nations and had been a member of the French Resistance during WWII, where she took part in setting up programs to assist prisoners of concentration camps. She was one of the fifteen founding members of the United Nations Commission on the Status of Women, established in 1946 as a mechanism to promote and monitor issues relating to the rights of women. A number of children had also been traveling on Flight 304 when it went down. Richard C. Yoder, recorded as of Villa Park, Illinois, was on the list of the dead. It is not known for what reason he was traveling on that fateful flight. Y.5.2.3. Roselee Annette “Toots” Yoder was born 25 March 1947. She married Leland Paul Rowe, Jr. on 24 January 1976 in El Paso County, Texas. They divorced on 10 January 1978. They had no children. Y.5.3. Warren Robert Yoder born 17 October 1911 died on 7 March 1928 from complications from mumps, in Davis Township, Starke County, Indiana. Y.6 William Yoder was born 11 September 1885 at Mackinaw Dells [Illinois]. In 1930, he worked in a lumber yard in Goodfield., Illinois. On October 1926, he married Katherine Heiser, and they started their married life in Goodfield, Illinois. They had no children. Katherine died on 23 January 1934. On 27 January 1940 he married Mrs. Mary Saltzman at Keokuk, Iowa. Mary had two children: Mrs. Eva A. Kath of Bloomington and Mrs. Elsie Norman of Peoria. William Yoder died 28 October 1942 at Bloomington, Illinois. He was a member of the Congerville Mennonite Church. He is buried in the Mt. Zion Cemetery, Deer Creek, Illinois with his first wife. Their burial plot is adjacent to that of her parents, Christian and Elizabeth Zehr Heiser. Katherine (her name is spelled Kathryn on her headstone) Heiser, wife of William Yoder, born near Allentown on May 14, 1885, was a daughter of Christian and Elizabeth Zehr Heiser. She died at her home on 23 January 1934 at the age of 48 years. She was of the Mennonite faith. 1920 Federal Census, Williams County, Ohio. Aviation Safety Network, an exclusive service of Flight Safety Foundation, http://aviation-safety.net/database/record.php?id=19640225-0. Bennett, Judy. Sexton, Masonic Cemetery, P.O. Box 1058, Las Cruces, NM 88004. Christian Evangelist – Obituaries, Joseph Yoder, William and Katherine Yoder. Daily Pantagraph – Bloomington, Illinois. Obituary of Charles Pepper. Eureka Times, Woodford County. Weekly Paper 1914. General Disasters, New Orleans, LA Lake Pontchartrain Airplane Crash, Feb. 1964. Genealogy Trails History Group, http://genealogytrails.com/newmex/donaana/masonic_pf-rh.htm. Illinois Mennonite Heritage Quarterly, Vo. XXIX, No. 4: “Immigrant Johannes Schrock (1801-1875) of Illinois”, by Donna Birkey. Metamora Herald, Metamora, Illinois. Obituary of John M Yoder and Matilda Yoder. Peoria Journal Star – Peoria, Illinois. Obituary of Robert Reel. The Register Guard, Eugene, Oregon. Obituaries of the Fiman Yoder family. Wikipedia: Eastern Airlines Flight 304, http://en.wikipedia.org/wiki/Eastern_Air_Lines_Flight_304. Wikipedia: Order of the Eastern Star, http://en.wikipedia.org/wiki/Order_of_the_Eastern_Star. Wikipedia: P.E. O. Sisterhood, http://en.wikipedia.org/wiki/P.E.O._Sisterhood. 1Donna Birkey, “Immigrant Johannes Schrock, Illinois Mennonite Heritage Quarterly, pp 64-65. 2Kathy Martin, comp. “Johannes Schrock and Catherine Salzman: The Story of Immigrant Johannes Schrock, Eldest Son of Joseph and Maria Neuhauser Schrag, and His Descendants”, paper presented at the IMHGS presentation of “Immigrant Family 2010: Featuring the Descendants of Joseph and Maria Neuhauser Schrag (Schrack) through their five immigrant children: Johannes, Peter, Andrew, Magdalena and Barbara,” Saturday, June 18th, Illinois Mennonite Heritage Center. 4Sheryl Kesey Thompson*, personal recollection of grandmother Geneva Smith Kesey. 6Sheryl Kesey Thompson*, personal recollection of grandmother Geneva Smith Kesey. *I am very grateful to Sheryl Kesey Thompson for her research and data on Firman “Joe” Yoder’s years at Eugene Farmers Creamery. –ed.